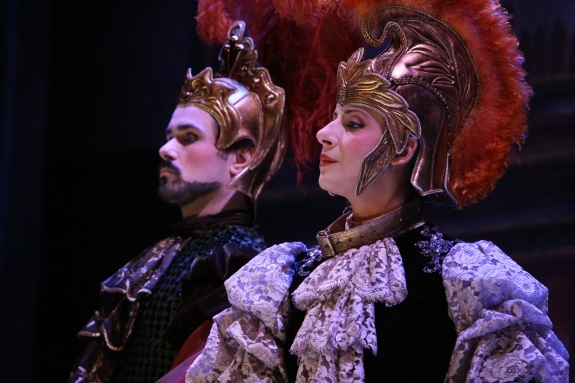 Partenope (Sonia Prina) is queen and founder of Naples: powerful, majestic… and single. Rather like Elizabeth I of England, she has attracted a swarm of hopeful suitors. For the time being she plays one off against the other while weighing up their comparative merits. There’s Armindo (Stefano Ferrari), prince of Rhodes, who has brought a host of warriors to fight under Partenope’s banner and who languishes in the hope that one day she’ll deign to return his love. 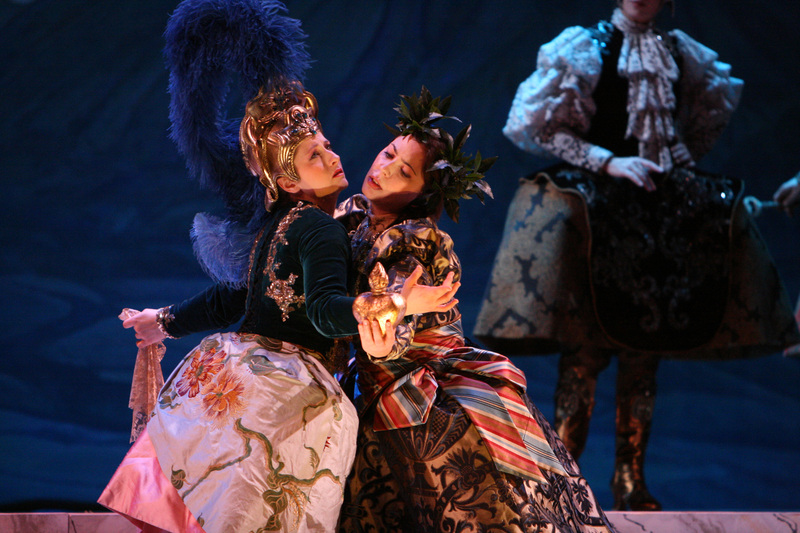 But Partenope has a soft spot for his rival, the dashing Arsace of Corinth (Maria Ercolano). As the opera opens, a third suitor arrives: Emilio of Capua (Eufemia Tufano), who crosses Partenope’s borders with his Cumaean army. He helpfully tells her that she has a choice: marry him or fight. Showing satisfying gumption, Partenope disdainfully sends him away and readies her troops for battle. You’d be forgiven for thinking that the story is about Partenope’s romantic and dynastic tribulations; but it isn’t. The opera follows Baroque convention in that the title character isn’t the protagonist: they’re just the person with the highest rank. The focus of the story is actually on Arsace, who finds himself entangled in a mess entirely of his own making. He’s come to Naples hoping to win himself a queen and a throne; but he’s neglected to tell anyone that he’s actually already spoken for: he’s promised to Rosmira, princess of Cyprus (Maria Grazia Schiavo). And this comes back to bite him. 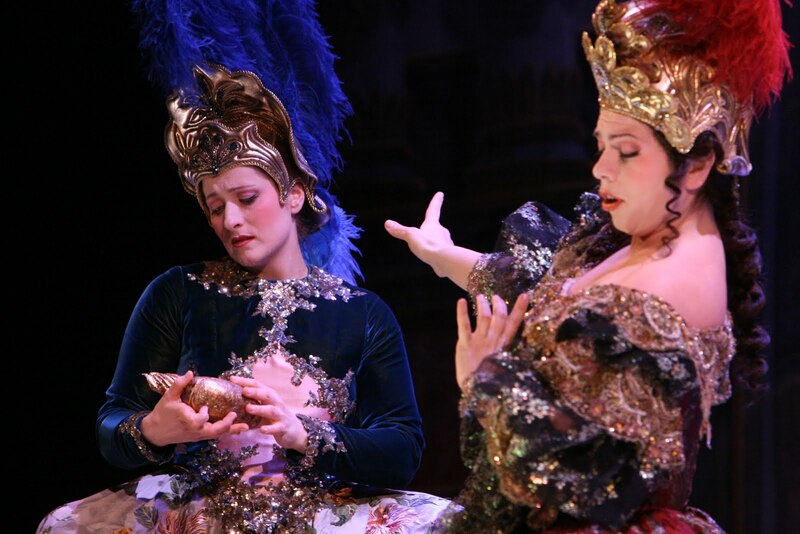 Rosmira, like Partenope, is a particularly feisty example of Baroque womanhood. Furious at having been abandoned, but unable to shake off her feelings for her errant lover, she comes up with a spectacular plan to make Arsace’s life very difficult indeed. And so, in the first scene of the opera, a stranger arrives in Naples: a young man who calls himself Eurimene, prince of Armenia. He claims Partenope’s protection and infiltrates himself into the court. Arsace, being a smart chap, isn’t fooled for a moment. As soon as he can get Eurimene on his own, he points out that Eurimene looks an awful lot like Rosmira. Rosmira berates him for his inconstancy and announces that she’s come in disguise to make sure that he’s punished for his infidelity to her. Arsace, whose affection for Partenope is largely political, simply doesn’t know what to do. He knows he’s in with a strong chance to win the queen’s favour, but how can he continue wooing her under the eye of the merciless, brilliant, slightly terrifying woman who should have been his wife? And things get worse. Rosmira extracts his solemn oath that he won’t tell anyone she’s a woman. She then sets about making his life hell. Disguised as Eurimene, she leaps with pantomime-boy gusto into her role: striking poses, striding around, bragging, taking offence at perceived slights and publicly tormenting Arsace. Armindo and Emilio marvel that the great prince of Corinth allows this whippersnapper to taunt him with no redress, but poor Arsace is sunk in utter misery. Now that Rosmira is physically back in his life, he’s reminded of all the things he loved about her. So he tentatively sets out to try to win her back and calm her scorn – discreetly, of course. But at the same time he has to tackle the chaos that ‘Eurimene’ is sowing by swaggering and posturing around the court; and Arsace can’t even begin to explain to his baffled peers why he’s being so soft on this headstrong young idiot. Matters eventually come to a head when the belligerent ‘Eurimene’ makes Arsace’s infidelity public and challenges him to a duel to avenge Rosmira’s honour. Vinci was offered the commission to write this opera for the Venetian season in 1725 and had to pull something out of the bag at short notice. It was such short notice, in fact, that he cobbled together some pieces of instrumental music from his earlier works. Fortunately the libretto of Partenope (which was also performed under the title La Rosmira fedele) had already been set to music by Domenico Sarro and Vinci simply lifted Sarro’s recitatives, which meant he only had to compose the arias. The result doesn’t quite have the musical integrity that Artaserse seems to have and, in any case, I don’t think Partenope is quite at the same level in general (I am trying, very hard, to be objective). The libretto is by Stampiglia and, having been spoiled by quite a lot of Metastasio, I didn’t think Stampiglia quite matched up lyrically. Having said that, it’s mainly about the music and Vinci managed to rustle up some fine arias. I found plenty here to add to my list of favourites. Act 1 offered a couple of highlights in the form of Arsace’s ‘swallow aria’, La rondinella che a noi sen riede, and Partenope’s splendidly martial A far stragi, a far vendetta. Act 2 added two more gems: the first was Rosmira’s Tormentosa, crudel gelosia, in which we have a glimpse of her inner misery, and which features an unbelievably catchy motif which I’ve been whistling all day. This was immediately followed by the kind of big, flashy aria that Vinci does so well: Arsace’s Sento che va coprendo, in which he struggles to understand his feelings for Rosmira. In its spirit, its opening and the potential for bravura self-indulgence, it reminded me very strongly of Vo solcando and naturally I loved it immediately. Finally, Act 3 offered plenty of plot development but a more modest number of arias, and there was only one which really caught my ear here: Rosmira’s Vuol tornare a la sua sponda, which was delightful partly for the music and partly for the minx-like mischief with which Schiavo performed it. I really warmed to Schiavo over the course of the opera. To be honest, I was already inclined to like her because I’d heard a clip of her singing Mandane opposite Fagioli’s Arbace in Hasse’s Artaserse, and anyone who tackles Mandane has a shortcut to my heart. At first I thought she had her strident moments (she doesn’t hold back on the blistering high notes) but she completely won me over with Tormentosa, crudel gelosia and her Vuol tornare was just lovely. She’s also fun to watch. I was similarly impressed by Maria Ercolano, whom I hadn’t come across before but whose warm, rich mezzo I liked very much. It’s difficult to feel entirely sorry for Arsace of course, because the whole situation is his fault, but Ercolano did a wonderful job of showing you his torn emotions and, especially in the final act, his distress at having to keep silent in the face of ‘Eurimene’s’ taunting. As for Prina, I’d been looking forward to seeing her in action; I’ve only heard her before, singing the dazzling S’ impugni la spada originally from Vivaldi’s Motezuma. She made a regal and magnificent Partenope (a role apparently originally written for Faustina Bordoni), even if Vinci doesn’t seem to have been quite as inspired with his arias for the contralto voice. Nevertheless Prina did a smashing job with A far stragi and showed us the human side of the queen in her anguished aria Godi e spera in Act 3. This was one of the few times that naturalistic emotion penetrated the stately elegance of the production. Tufano’s Emilio and Charles do Santos’s Ormonte had relatively little to do; and unfortunately Stefano Ferrari was more than a little overshadowed by the formidable ladies around him. He didn’t seem to have enough power behind his voice to hold his own with them and he looked self-conscious throughout – although that might have been due to his costume. As you know, I’m a traditionalist and I doubt there’ll be a more historically authentic production than this unless someone can find some castrati somewhere. The set is a palatial sweep of classical arches with Vesuvius painted on the backdrop; there are wooden waves rising and falling at the back; ‘Eurimene’ arrives on a Baroque fantasy of a Roman galley. 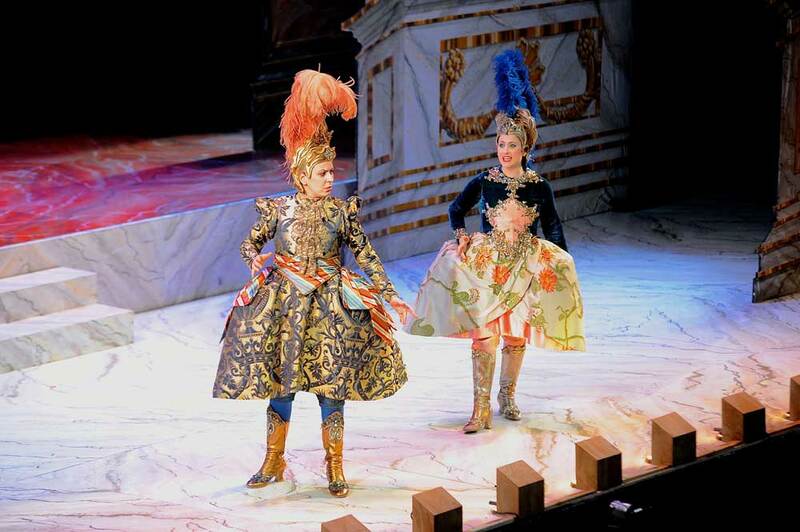 The costumes are mercilessly faithful to 18th-century operatic practice, with classical helmets and massive plumes for everyone (male or female) and acres of lace. The men wear puffed, gathered sleeves, knee-high boots and the panniered kilts called tonnelets. Those singing arias descend to the front of the stage, while the other characters stand behind them in artfully disposed ranks, holding what seems to be the Standard Baroque Waiting Pose™. Yes, it is a bit stiff and staid, but that’s the point; presumably that’s what it would have been like in the 18th century. Sometimes, to liven things up, there’s a little ballet instead, in which decorative ladies and statuesque men play out the character’s emotional dilemmas; and occasionally there’s more vigorous choreography, mostly notably in the battle at the end of Act 1. While Prina, in her splendid gown, crosses swords with Emilio, a gang of soldiers energetically bash one other in the background. That scene is enormous fun. The cast must be commended for taking it all absolutely seriously, because the faintest hint of irony would undermine the whole spell. Another element of historical accuracy is in the use of intermezzi. These comic interludes are interspersed with the acts, as they would have been in the 18th century. They fulfilled the same function as cartoons before the main feature at a cinema: to warm up the audience and to provide a temporary spritz of humour before we return to the serious matter of love, intrigue and politics. The intermezzi on the DVD (which don’t appear on the CD) are based on those by Domenico Sarro, and they feature two characters: the plucky servant Beltramme, who is attempting to woo the lady-in-waiting Eurilla. For added humour, both parts are played by men: Borja Quiza (Beltramme) is rather charming, with a lovely tenor, while Pino De Vittorio turns in a striking performance as the haughty grande dame Eurilla. This performance was recorded in Spain and so Beltramme and Eurilla bicker in Spanish and throw in fandangos and popular songs before returning to the Italian comic songs of the original intermezzi. It’s all done very well. Judging from comments on Amazon, some people aren’t overly keen on the intermezzi but I think it all depends on your attitude. I’d recommend buying this DVD not simply as a record of Vinci’s opera – for that, you can get the CD, which cuts out the intermezzi – but as a way to transport yourself back in time and to imagine what it would have been like to spend an evening at the opera house in 1725. Seen as an experience, not a text to be kept inviolate, the production suddenly gains extra life and vivacity. This opera has been tackled by a number of people, notably Vivaldi and Handel, but I’m delighted that I saw it for the first time in Vinci’s version and in this production. It was a super, colourful way to be introduced to such a fun comedy of manners, not to mention acquainting me with some more very impressive singers of the Baroque canon.